Note: This article was originally published on 13 July. I have made modifications on 17 July. The big announcement from Microsoft last Thursday was Office 2016 for Mac is here! Ed Bott has a glowing review at New Office 2016 for Mac makes life easier for the cross-platform crowd. We’ve known for months that Microsoft has been working on Office 2016 for both Windows and Mac. I’ve been playing a bit with the Office 2016 for Windows preview for a while, but I haven’t done much with the Mac preview. The Office 2016 for Mac user interface is very much like that for Office for Windows. It no longer feels like a toy program built by an 8th grader in shop class. This is a very good sign. Now Office looks and feels the same across all platforms: Windows, Mac, Android, iOS. Earlier, Microsoft Introduc[ed] new and modern chart types now available in Office 2016 Preview. The latest Office 2016 preview features a few new chart types, including some that were previously only available to users of add-ins like the Peltier Tech Chart Utility. Microsoft has added waterfalls, histograms, paretos, treemaps, and sunbursts. The Windows Office 2016 preview has only been available through Office 365 (the kludgy online subscription service). I never can remember which of my umpteen Microsoft logins is valid for Office 365, and even when I look it up, the correct user ID and password don’t work the first time. Updating Windows Office 2016 preview versions has never gone without several major hitches for me, followed by complete uninstallation then reinstallation from scratch. So far, Mac Office 2016 is only available via Office 365, which Microsoft treats as a good thing. In Windows, installing from Office 365 wipes out any older versions of Office, so you can’t run Office 2007, 2010, and 2013 side-by-side to support different clients. On the Mac, I was glad to see that I could install Office 2016 without wiping out the previously installed Office 2011. I did have to rebuild the LaunchPad links to Office 2011 and put the icons back onto the Dock, but that only wasted an hour. This is the painful one. Mac Office 2016 does still support VBA, of course, and Microsoft has rebuilt the VBA Editor from scratch, which was drastically. Unfortunately the VBA Editor is not really ready to use: you can’t insert new modules or UserForms, and while you can edit existing modules, you can’t even view the UserForms. Microsoft is making small improvements to the VB editor, and these improvements will be part of the monthly updates. but they are not expecting to make the editor as functional as that in Windows. They encourage developers to build their add-ins in Windows versions of Excel or in Excel 2011, then test in Mac Excel 2016. In Office 2003 and earlier, developers and users could construct custom menus and toolbars to access built-in and custom functionality. Starting in Office 2007, Office for Windows has had the ribbon. It could readily be modified for developers willing to delve into RibbonX, a variation of XML used to control and customize the ribbon. Since Office 2010, the ribbon could also be easily modified through the user interface. While custom menus and toolbars were no longer supported in Office 2007, any custom menu items were put into a special Add-Ins ribbon tab. Windows Office add-in developers, myself included, have migrated to custom ribbon interfaces, to great effect. Mac Office 2011 introduced a low-functioning ribbon, which did not allow any customization programmatically or through the Office interface. However, the custom menus and toolbars that were discontinued in Windows Office are still supported in Mac Office 2011. Mac Office 2016 has a better ribbon than 2011, but it is still not customizable by the user, nor can it be it controlled using RibbonX. Custom menus and toolbars are no longer supported in Mac Office 2016, but there is an Add-Ins ribbon tab to handle legacy menu items. Microsoft is working on implementing RibbonX interface controls for Mac Excel, and it will be rolled out as part of a regular update. Until then a Mac Office add-in developer should still build legacy menu-type user interfaces. One more drawback is that Mac Office 2016 now runs in a sandboxed mode, so certain features are more difficult for developers to implement, features such as accessing folders and opening files. I don’t know the full ramifications of this behavior, since my code isn’t yet running properly in Mac Office 2016. Therefore, if you are using any add-ins to extend the features of Mac Office, you should not upgrade until you know whether these add-ins will work properly in Mac Excel 2016. Peltier Tech has taken steps to prepare for Microsoft Office 2016. The Windows version of the current Peltier Tech Chart Utility was designed for Office 2007 through 2013, and it can to run in the preview of Office 2016, but it will not work in the eventual commercial release of Office 2016. As always, there are a few minor changes that need to be made to accommodate new features and syntax of the new Office version. In addition, Peltier Tech is working on a major upgrade to the utility, called Peltier Tech Charts for Excel. This edition will work in Windows Office 2016, but also 2013, 2010, and 2007. It will also run in Mac Office 2016, when that has become capable of supporting add-ins, and of course, it will run in Mac Office 2011. The exciting part is that the same add-in file will work in both Windows and Mac, so users stuck between platforms will not need to license two separate add-ins. The new Peltier Tech Utility will feature all of the old charts, including the ones that Microsoft is introducing in Office 2016, because some Peltier Tech customers will still be using older Office versions. New chart types are being developed, including grouped box plots and sensitivity tornado charts. 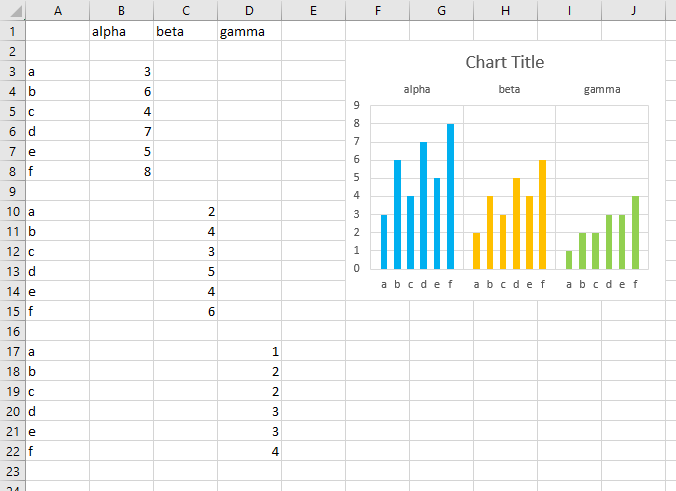 If you have a favorite chart type that neither Microsoft nor I have made available, mention it in the comments below, and Peltier Tech will add it to the long long list of suggestions. 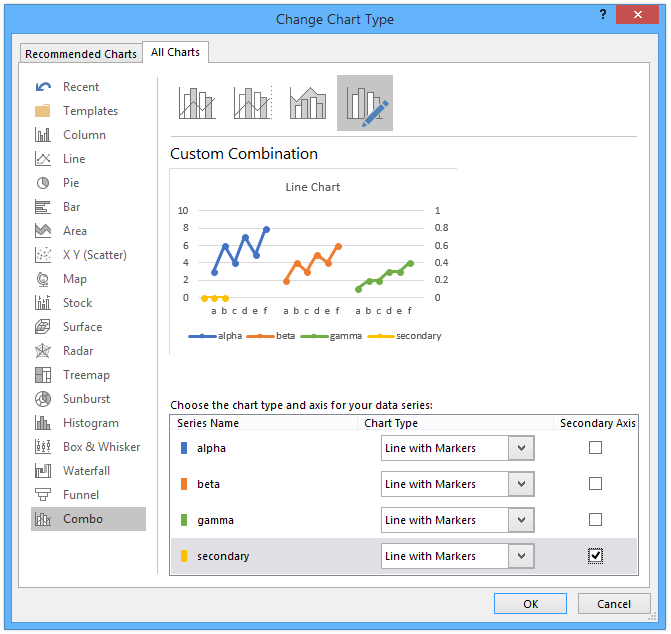 The new Utility will also offer some new features, including more powerful chart data manipulation tools. Again, if there’s a feature you can’t live without, let us know in the comments. The new Utility will likely have Standard and Advanced editions like the current Utility, and these editions will likely be priced at the same levels as the current utility. Existing users of the current Utility will be able to upgrade at a 50% discount, and users of the older family of utilities will qualify for a 25% discount. In addition, bulk and academic discounts will be available. 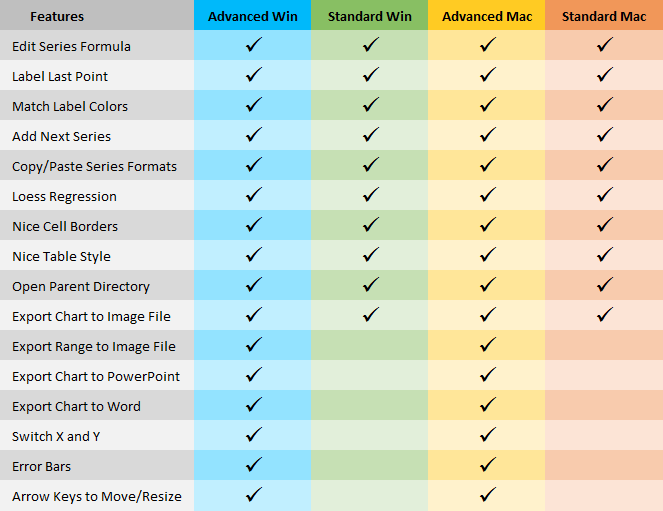 Another exciting development is Peltier Tech Charts for PowerPoint, and in all likelihood Peltier Tech Charts for Word. These are still now in their infancy, but it will bring easier linking of standard PowerPoint and Word charts to Excel data, as well as at least a partial menu of Peltier Tech custom charts. So far the new utility is only in the alpha testing stage, meaning new pieces are being incorporated and tested in-house only. In about a month a beta version will become available. Current and potential new users will be able to test and comment on it. During the beta testing period, users of the current Utility will be able to lock in their upgrade at a discount of 60%, users of the older family of utilities at 35%, and new users at a discount of 10%. More details will become available over the coming weeks. Posted: Monday, July 13th, 2015 under Excel 2016. Tags: Excel 2016, Macs and PCs, Utilities. In only a month, I’ve converted the Advanced Edition of the Peltier Tech Chart Utility so that it works on a Mac as well as in Windows. I’m pleased that every feature from the Windows version has made it into the Mac version, though some options are not available. This is due mostly to the inconsistencies between Office on the Mac and Office in Windows, such as the unavailability of modeless forms and the reduced selection of Paste Special options in MacOffice. A small number of differences relate to incompatibilities between the two platforms themselves, such as the strange special keys and special key behavior on the Mac (somehow the Mac’s Cmd-Ctrl-Opt-Shift keys provide less functionality than Windows’ Ctrl-Alt-Shift). And the lack of a customizable ribbon in Mac Office means the user experience is less fulfilling than in Windows. In addition to the charts shown here, any new custom charts developed by Peltier Tech will become part of the Advanced Edition. If you hear from the Peltier Tech twitter feed or the Peltier Tech Blog that a new chart has been added (or a bug has been fixed), email for a new download link so you can keep your license up-to-date. In addition to the features shown below, any new functionality developed by Peltier Tech will be added tothe Advanced Edition. If you hear via the Peltier Tech twitter feed or the Peltier Tech Blog that a new feature has been added (or a bug has been fixed), email for a new download link so you can keep your utility current. The Advanced Edition for the Mac runs on the latest updates of Excel 2011 for the Mac, and whatever relevant versions of the Mac OS that supports Excel 2011. Mavericks, Mountain Lion, Cougar, even Water Buffalo, for all I know, which I find more confusing than Microsoft’s imaginative names, like Windows 7, 8, 3.14, etc. Joking aside, if you keep your Mac software up-to-date, you should have no problems. 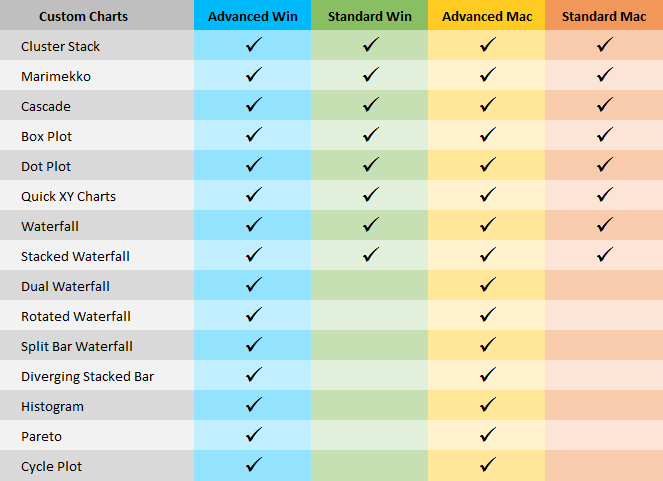 The Advanced Edition of the Peltier Tech Chart Utilities for the Macintosh will be available on Tuesday, July 8, 2104. Mark your calendars so you don’t miss the special offers. Posted: Thursday, July 3rd, 2014 under Utilities. 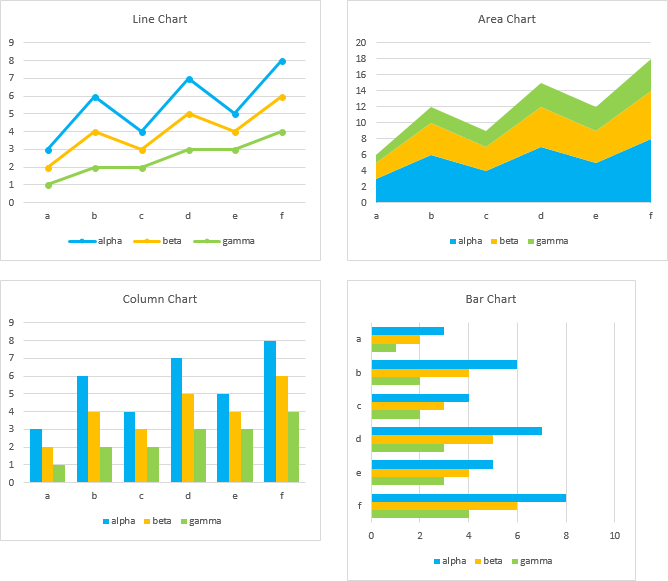 In a recent tutorial I showed how to make Variable Width Column Charts. A stacked version of this chart type, called a Marimekko chart, is popular in business, particularly where marketing departments analyze segmentation of their markets. 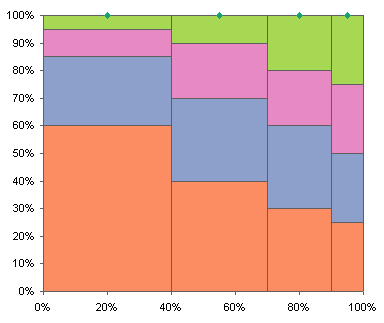 The Marimekko chart gets its name from the patterns found in Marimekko fabric. 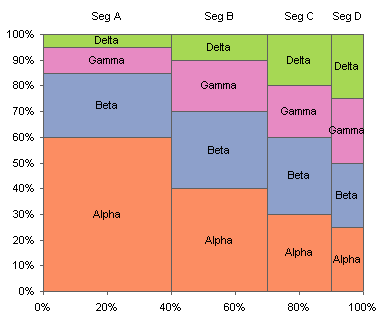 Suppose we have four companies, Alpha through Delta, competing in four segments, A through D, of a particular market. This could be like the companies Dell, HP, and Toshiba competing in the laptop, desktop, and home server segments of the personal computer market. A summary of the data would look like this table. 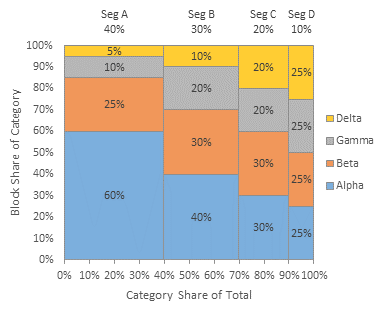 The sum of the segment percentages is 100%, and the market segment shares of the companies in each segment (each row) also sum to 100%. 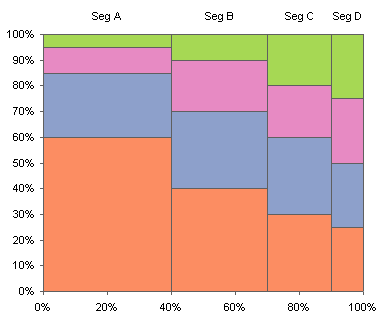 Like most non-standard charts, we have to arrange the chart source data in a special pattern. 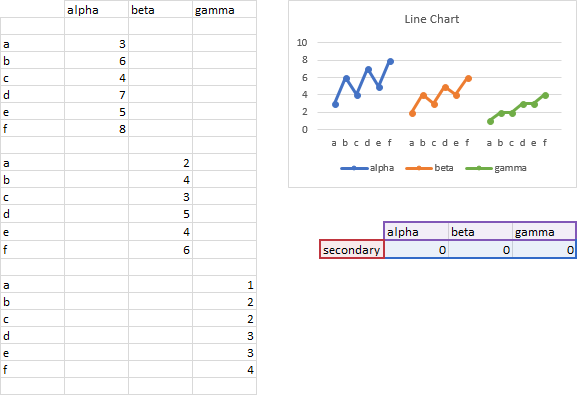 Here is how the above data is rearranged. 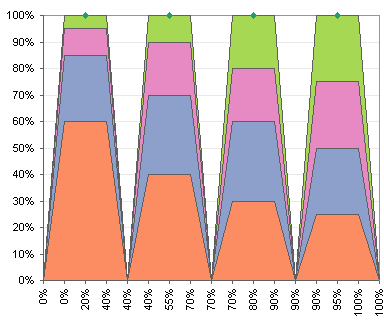 The first column, the X values, comprise a cumulative percentage of the segment percentages: 0, 40, 70 (40+30), 90 (40+30+20), and 100 (40+30+20+10). Each of these values is listed three times. 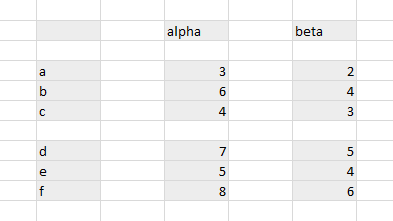 In between each of these values, I’ve inserted another row with the average of the values above and below, with orange text. These orange values correspond to dummy data which will provide labels later in this protocol. 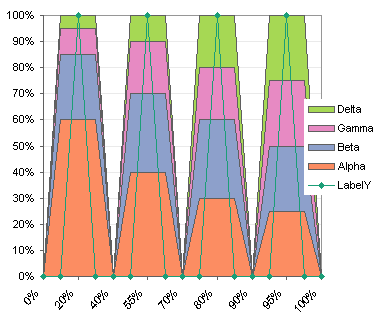 Note that the X values look like percentages, but are not. 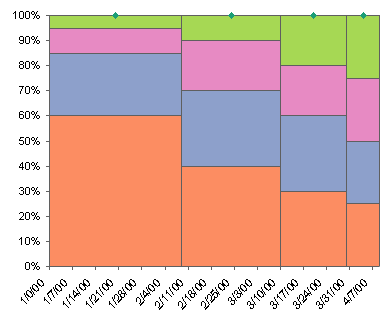 A date-scale axis, which we will use to spread out the widths of the area chart data, cannot render fractional values. These X values are whole numbers, and I’ve used a number format of 0"%" with the percentage symbol in quotation marks to place it as generic text after the whole number. The Y values for each series and each segment are repeated three times, at the beginning, middle, and ending X values for this segment. For example, Alpha has 60% for Seg A in rows 3 through 5, next to X values of 0%, 20%, and 40%. The Y values return to zero at the end of each segment. 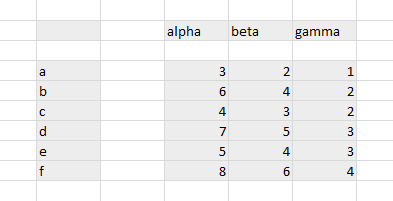 Alpha shows 0% in rows 2, 6, 10, etc. The column labeled “dummy” holds Y values for a dummy series that will provide the labels in the column marked “Labels”. 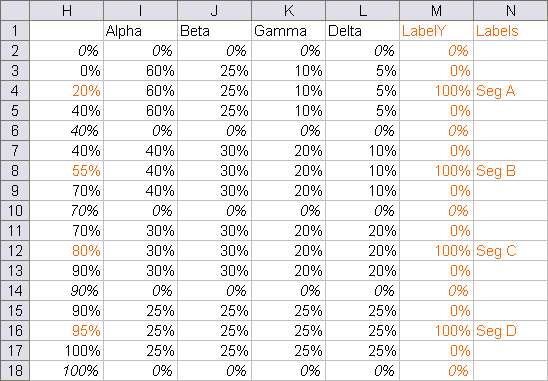 I’ve colored this text orange to indicate labeling helper data, corresponding with the inserted orange rows above. Select the data in columns H through M and create a stacked area chart. 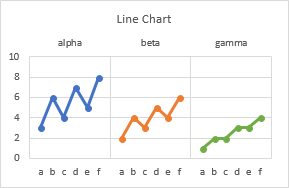 Convert series LabelsY into a line chart series. 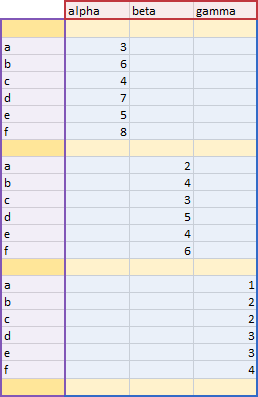 If you clear the zero values in the LabelY data, column M, the points and connecting lines will not clutter up the chart. Clear the legend to add more room for the chart. Now the X axis needs to be adjusted. 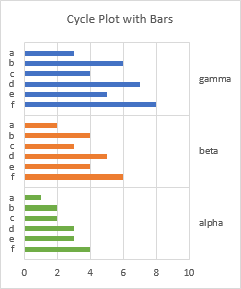 All the X values in column H are treated as text labels, equally spaced without regard to their numerical value. In Classic Excel (2003 and earlier) select the chart and go to the Chart menu > Chart Options > Axes tab. 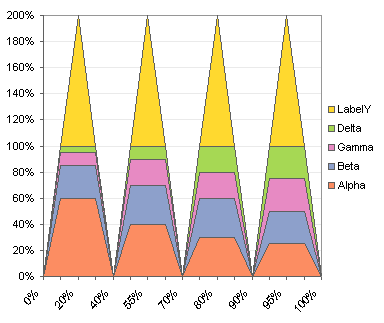 The Primary Category axis is listed as Automatic. Change this setting to Time-Scale. In New Excel (2007 and later) select the axis and press Ctrl+1 (numeral one) to open the Format Axis dialog. Under Axis type, change Automatically Select to Date Axis. The result is that all Y values for equal X values are vertically aligned, as if in an XY chart. Of course, Excel has helpfully converted the values into dates, spaced one week apart. 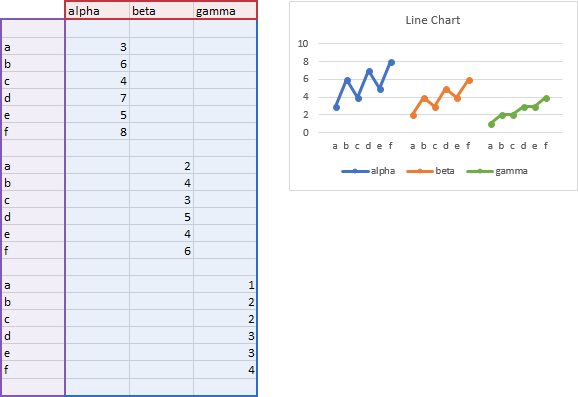 Format the X axis scale so it runs from 0 to 100 in steps of 20 (not percent but whole numbers). 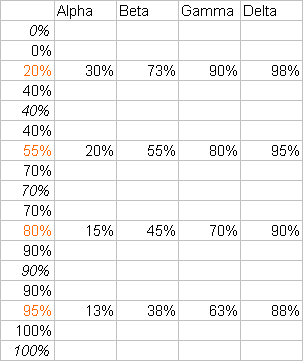 Apply a number format of 0″%”, which places the percent sign in quotes so Excel adds it as text to the end of the whole number rather than converting the value to a percentage. To add segment labels, I use Rob Bovey’s free Chart Labeler utility. 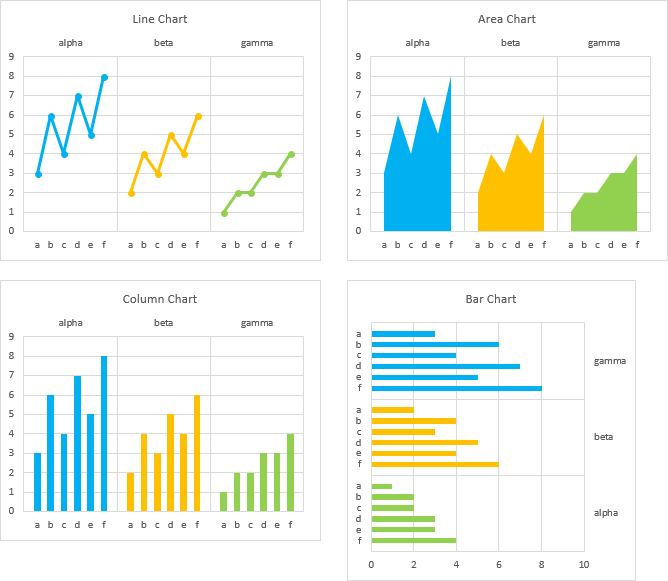 This utility adds a menu item called “XY Chart Labels” to the Tools menu. 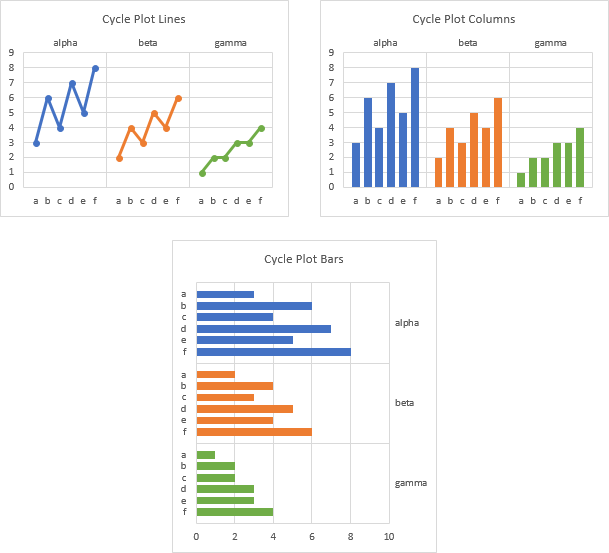 It works on any chart type that accommodates chart labels, not just XY charts. 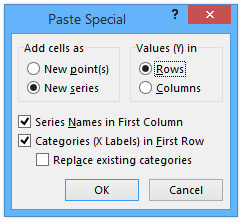 Using the utility, assign the labels in the Labels column to the LabelY series. The labels here have been positioned above the points. Format the Labels series so it uses no markers or lines, and these points will no longer appear. To add labels to the blocks in the chart, you need points which will be located in the center of each block. The X values are the same as above, but the Y values for each series (the names are the same as above, but they are distinct series) are calculated to place a point at the mid-height of each block. 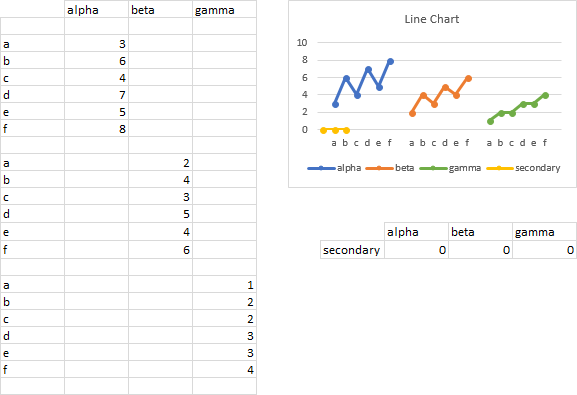 Copy this data, select the chart, and use Paste Special to add the data as new series. 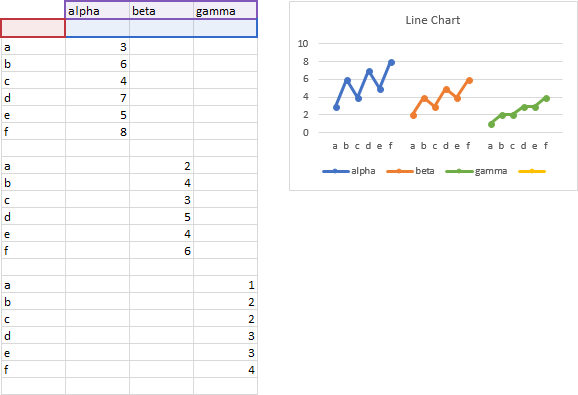 Since the last series in the chart, LabelsY, had been converted to a line type, these are added as lines. 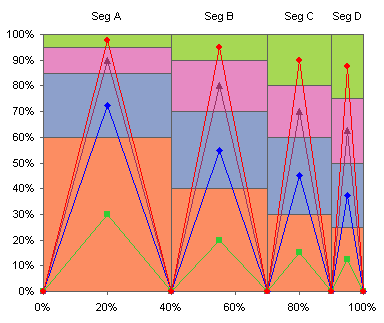 Notice that the points are located exactly where needed, although there are also points along the category axis and lines everywhere. 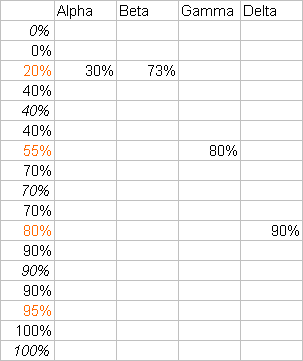 Clear the cells with zero values. . .
. . . and only the desired points will remain in the chart. 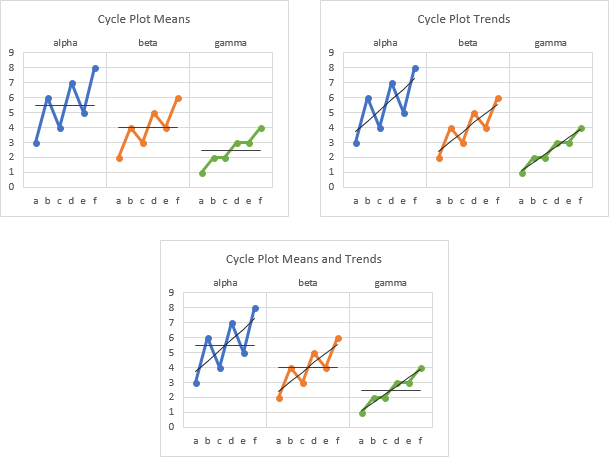 Format each series so it uses no lines or markers, and so it also displays data labels using the series name. 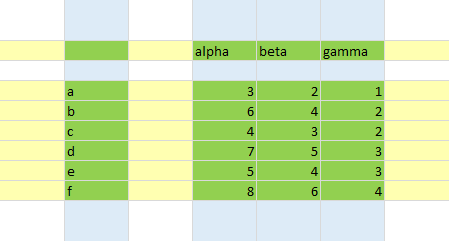 Then format the labels so they are centered on the points (the default is to the left of the points). This chart has way too many labels. We could get away with one label per series. 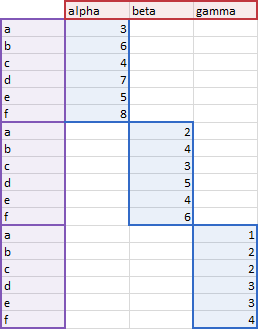 I’ve removed all Y values except for the ones that put points in the largest block for each series. This is a much cleaner chart. 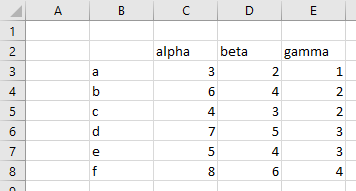 Naturally you could tailor the labels to show a dollar value or a percentage, or any other information, but you would need not only a table containing the X and Y values as shown in the table above the last, but also a table containing the values to be used for each label. You would use Rob Bovey’s Chart Labeler to apply the labels, as described for the segment labels along the top of the chart. 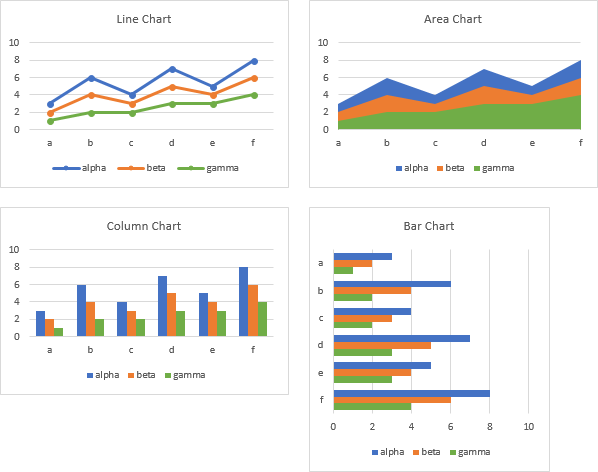 This tutorial shows how to create Marimekko Charts, including the specialized data layout needed, and the detailed combination of chart series and chart types required. This manual process takes time, is prone to error, and becomes tedious. 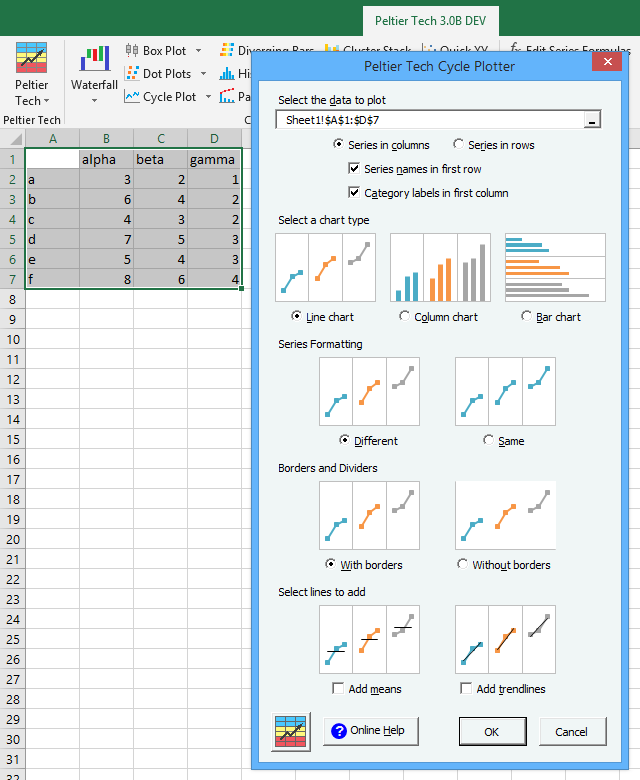 I have created Peltier Tech Charts for Excel 3.0 to create Marimekko Charts (and many other custom charts) automatically from raw data. 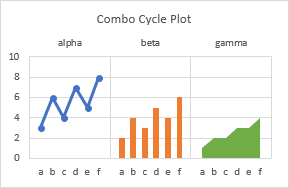 This utility, a standard Excel add-in, lays out data in the required layout, then constructs a chart with the right combination of chart types. This is a commercial product, tested on thousands of machines in a wide variety of configurations, Windows and Mac, which saves time and aggravation. Posted: Tuesday, February 17th, 2009 under Example Charts.